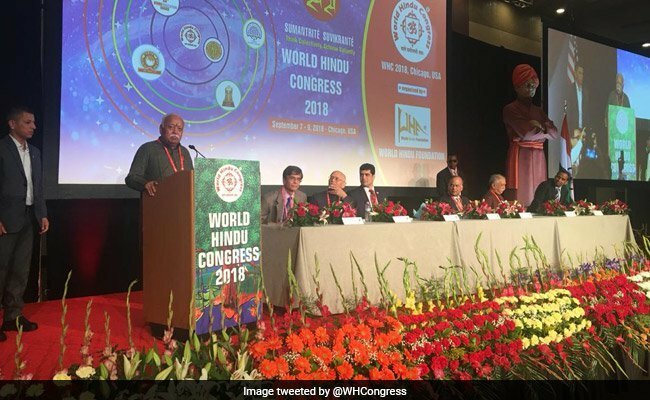 The World Hindu Congress (WHC) ran its course this past weekend in Chicago. A few hundred delegates gathered to consume a standard fare of Hindutva speeches and hate-mongering while a sizeable protest canvassed local Chicago citizens against the fascist gathering in the neighbourhood. What started out in planning almost a year ago as an anticipated thunderous roar of Hindutva celebration in North America turned out to be in the end, just about a little bit of a growl and a snarl. Gere and Yogi Adityanath to Fadnavis to Sri Sri Ravishankar. Beyond these names, the crown jewel of the WHC in the role as Chair of the conference was Tulsi Gabbard, U.S. Congresswoman and rising star in the Democratic Party. In the end, almost no celebrity showed up. Gabbard was the first to fall. CDCD (Campaign for the Defence of the Constitution and Democracy), an activist coalition of Indian progressives and minorities ran a targeted campaign as early as June asking Gabbard to step out. Eventually, she pulled out of the conference, and under sustained pressure issued an official note in September distancing herself from the RSS /VHP. Other political figures listed as attendees by the WHC, such as Assembly member Ash Kalra (D-CA), Congressman Ro Khanna (D-CA) and Senator Jay Chaudhuri (D-NC) too withdrew as a result of the CDCD campaign which picked up momentum by August and successfully exposed the WHC as being nothing but a Hindutva jamboree. As the luminaries who would have given the event the sheen of neutrality - the Dalai Lama and Richard Gere, Gabbard and other elected representatives from the US, and virtually all respected academic and intellectuals - fell away, the who’s who of Hindutva from India also dropped off. It was probably not worth their while anymore. In the end then, the event stood exposed for what it was - a gathering of fascists with Mohan Bhagwat, the Sarsanghchalak (Supreme Commander), and Dattatreya Hosabale, RSS Sah-Sarakaryavaah (Joint General Secretary) and their attendant set of diehard ideologues giving rousing speeches to each other about Hindutva favorites such as Love Jihad and Gauraksha. There were several public protests at the WHC by various Sikh, Dalit-Bahujan Muslim, and social justice groups. A young member of ‘Chicago South Asians for Justice’ who participated in the protests noted that she joined the protest to oppose the violent ideology of Hindutva. She sees a direct connection between Hindu Nationalism in India and White Nationalism in the US and sees recent political developments in India and the US as part of the rise of fascism worldwide. The WHC was, one could argue, designed as a kind of a curtain raiser to the 2019 general election in India. It would have been a space for the BJP heavy-hitters to position themselves as part of a group of global celebrities. The packaging was supposed to project the BJP team as part of a group of successful NRIs as well as an international elite. Unfortunatley, for the Sangh this was not to be. The resounding failure of the WHC offers lessons for Indians and Hindus in the US. Packaging Hindutva as ‘Hindu resurgence’ does not work. Members of the Indian diaspora who value human rights and basic civil decency are all too familiar with the BJP’s record - openly baring its fangs in India while clothing itself as liberal and humanist in the US. American political representatives with a South Asian background who turned away from the WHC have underscored the fact that the RSS and the VHP, and their minions in the US do not speak for all Indians or all Hindus. The failure of the WHC also carries lessons for progressive individuals and collectives of Indian origin in the diaspora. The world is watching as India’s constitutional rights are being trampled upon by the leaders, footsoldiers and ideologues of Hindutva. The brazen humiliations, openly celebrated lynchings and rapes of Dalits, Muslims and adivasis, terrorising of human rights defenders and of activists fighting for civil liberties, and assassination of intellectuals and destruction of all democratic institutions have been described by none other than the Supreme Court of India as the ‘normalization of a mobocracy’. S Karthikeyan, Secretary of the Ambedkar King Study Circle in the San Francisco Bay area notes “the WHC is merely using religion to hide its politics just as Ambedkar had predicted”. He called on all the democratic and progressive forces among the Indian diaspora to come together to avert any further damage to our plural and diverse culture and civilization. These are historic times. The claims of India being the ‘world’s largest democracy’ or of ‘Hinduism being tolerant’ have gone beyond sounding utterly hollow, to actively abetting crimes of the most heinous nature being perpetrated daily by the Hindutva brigade in India. It is time for all progressives to come together with a common minimum program that would send a clear signal to everyone.